Meyers Law Firm, PLLC, which serves Lawton, South West and South Central Oklahoma, has been representing individuals and businesses in estate-related matters since the firm’s establishment in 1985. Our principal lawyer, Mr. Meyers, has been AV® Preeminent™ Peer Review Rated by Martindale-Hubbell® for more than 30 years. Often, disputes arise among family members in trust, estate and probate matters and these disagreements sometimes develop into intense and ugly battles. We are particularly skilled in resolving such disputes successfully. To prevent such potential disputes, we can assist you in developing an advance estate plan that clearly delineates your wishes for the future distribution of your assets. Distinguished rating — Mr. Meyers has been AV® Preeminent™ Peer Review Rated by Martindale-Hubbell® for more than 30 years. He is recognized in the community as a results-oriented lawyer who is committed to excellence and personalized legal representation. Highly experienced in estate matters. — The firm’s history of success allows us to maximize the chances of extricating you from an estate entanglement unscathed. You can also benefit from our estate planning strategies, which will help to minimize your tax liability and allow your loved ones to enjoy your property to the maximum extent. We are committing to protecting your estate assets from the risk of being lost to the state. In addition, we strive to formulate for you the best possible tax planning strategies to minimize your tax exposure. Exceptional client care, commitment and respect — Our mission is to “Do unto others as you would have them do unto you.” This means that you can depend on us to treat you with the respect that you deserve and protect your welfare by protecting your assets. When you find yourself embroiled in a family dispute concerning an estate matter, you need a lawyer with a high level of legal experience in law of estates. We can assist you successfully whether you have a basic case or a highly complex one. We have the necessary skills and experience to represent you effectively. 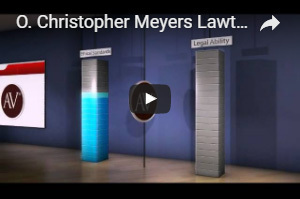 Call Meyers Law Firm, PLLC today at 580-215-4209 or contact us online to begin resolving your legal issues. Mr. Meyers is extremely knowledgeable and helpful in choosing which avenue to pursue in estate planning and taxes. He saved us thousands of dollars. Meyers Law Firm, PLLC is located in Lawton, Oklahoma and serves clients in and around Fort Sill, Lawton, and all of the Southwest and South Central Oklahoma.